Blue Cat's StereoScope Multi is a unique tool to compare the stereo image of several tracks in real time. It is the ideal solution for mixing: you can actually see which part of the stereo field every single instrument uses. It can also be used to analyze an effect chain and see how audio effects influence the stereo image of your content. The instant, peak or average responses of several audio tracks can be displayed on the same graph (the plug-in supports up to 16 curves). The zooming capabilities and coordinates display let you exactly measure the characteristics of the stereo image for each audio track. 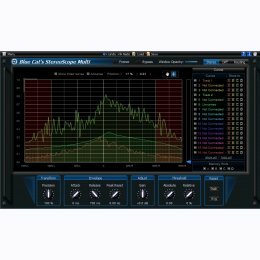 The advanced routing capabilities let you can define different settings for each track and thus adapt the parameters for each audio signal you want to analyze. Supported platforms: Mac-AAX, Mac-AU, Mac-VST, Windows-AAX, Windows-DX, Windows-VST.